In 2015, Laura L. Balliett pitched her Cool School Rap idea at Accelerate. The Cool School Rap is an educational comic series that breaks down complicated science, technology, engineering and mathematics (STEM) curriculum into a highly visual, easy-to-read format. 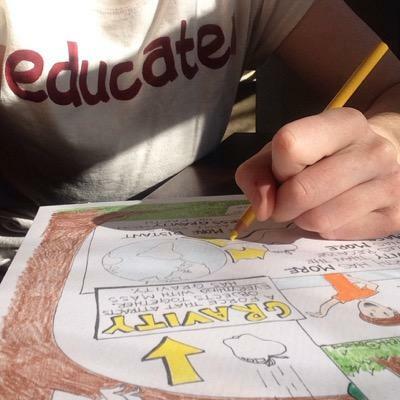 To go along with the comics, Laura envisioned creating lesson plans to deliver content and guide educators and students through inquiry/project-based learning, as well as an animated series and interactive website. Since 2015, Laura has continued to develop The Cool School Rap comic series. As the new STEM teacher at a charter school for at-risk youth in Lakewood, she is writing STEM curriculum in comic form and making it available to other teachers. She is adding new comics weekly and gauging their effectiveness. Visit the Cool School Rap website to see and purchase her comics. You can also follow @CoolSchoolRap on Twitter to stay on top of Laura’s developments and to learn some cool science facts.